The second week of football is over and thankfully this week we had very few injuries. Several players like LeSean McCoy and Jay Ajayi had some injury scares, but as of now seem to be fine enough to not miss any time. Maybe it's time for you to make a splash in the waivers, so let's look at some players worth taking a shot on this week. The only player to really benefit from an injury to a teammate this week, Giovani Bernard should get the start over the next two weeks (or more) while RB Joe Mixon misses time with a knee injury. Gio has had a rough start to the season, only carrying the ball 7 times for 25 yards and catching 5 passes for 26 yards. He was much more involved against Baltimore this past Thursday night, getting 7 targets and 6 rushing attempts. With Mixon out, Bernard should see a lot of work since he can both run and catch. Bernard can be added in all leagues if you need a running back for the next few weeks. Once Mixon returns, Gio can probably be dropped again. Austin Ekeler was on this list last week, but with RB Melvin Gordon dinged up (he was held out most of the 4th quarter with a minor injury), Ekeler was even more involved this week. Against the Bills, Ekeler rushed 11 times for 77 yards and caught all 3 of his targets for 21 yards. He is still being heavily utilized in this Chargers' offense and seems to have decent Flex appeal in 12-team leagues. Geronimo Allison is another player we had on this list last week, but after another decent game he should be added in much more than just 31% of fantasy teams. Allison caught 6 of 6 targets for 64 yards against a tough Viking defense. That puts him at 14 targets for the season, and it appears as though QB Aaron Rodgers trusts the young receiver more and more. A terrible run game only adds the amount of targets these Green Bay receivers will see. Allison should be added in 12-team leagues. The Baltimore Ravens have shown that they like all of their running backs, and that is still the case with Javorius Allen. Even though the lead running back is Alex Collins, they still gave Allen 11 touches last week against the Bengals. Allen might not be a great runner, but he is a much better receiver than Collins. He has 10 receptions this year, and is one of QB Joe Flacco's favorite targets. With RB Kenneth Dixon out for a long time, Allen should continue to get a ton of work. He is more of a PPR add in 14-team leagues. I was really rooting for Josh Gordon. But the Browns finally had enough of the situation, and have decided to move on from the troubled receiver. Enter WR Antonio Callaway. Callaway was hyped up this offseason, but was firmly behind Gordon, Landry and Rashard Higgins in the depth chart. With Gordon gone, Callaway played a lot more snaps this week against New Orleans. He was targeted 4 times, catching 3 passes for 81 yards and 1 touchdown. It might not seem like a lot, but the athleticism is too hard to ignore. Callaway can be added in 12-14 team leagues in hopes that he can be as electric as Josh Gordon once was. The Buccaneers are explosive so far this 2018 season, and WR Chris Godwin has emerged as a solid receiving option. Last week against the Eagles Godwin caught 5 of 6 targets for 56 yards and 1 touchdown. Godwin now has caught a TD in each of the first two games. With QB Ryan Fitzpatrick seeming to be a top 3 QB (so far), Godwin could have bigger games in the future. Godwin can be added in 12-14 team leagues as long as the Buccaneers keep playing like this. 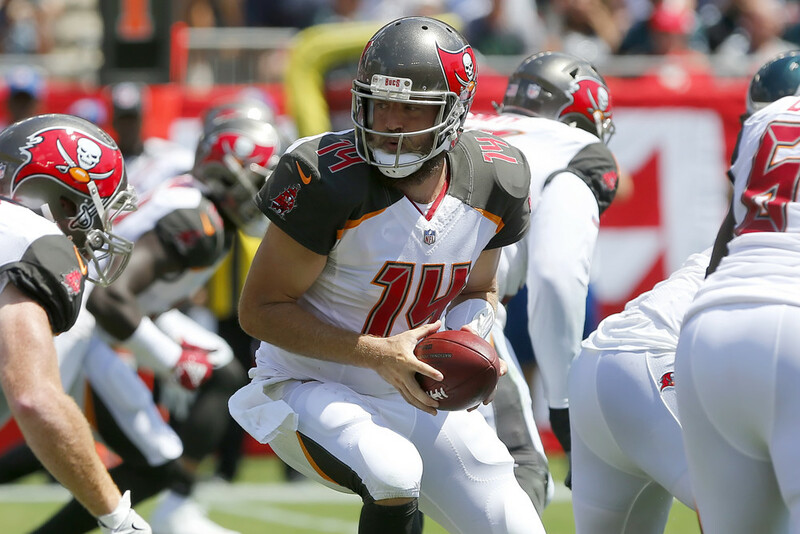 Ryan Fitzpatrick did it again last week, throwing for 402 yards on 27 completions (33 attempts) and 4 touchdowns. That's two weeks in a row now that Fitzpatrick has thrown for over 400 yards and 4 touchdowns. He has now beaten a top-5 Saints' defense and the defending Super Bowl champion Eagles. This is not the first time either that Fitzpatrick has done this. In 2015 he threw for 3905 yards and 31 touchdowns. It's gotten to a point where the Buccaneers would be insane to put QB Jameis Winston in when he returns from suspension. Even if you don't need a QB, Fitzpatrick could be added if you need high risk, high reward play. Now Tyrod Taylor may usually be more of a streaming option, but he now has two weeks in a row where he has been a fantasy relevant quarterback. Last week against the Saints he completed 22 of 30 pass attempts for 246 yards, 1 touchdown, and 1 interception. He also rushed 4 times for 26 yards, which was not nearly as good as Week 1 against Pittsburgh where he rushed for 77 yards and 1 touchdown. Taylor can run, and that is a big fantasy asset to have. With WR Jarvis Landry and Antonio Callaway, Taylor should have plenty of passing options to have a better passing game. Taylor gets the Jets and Raiders the next two weeks: two teams he should fare well in.